Insurance companies have an average audience size on Facebook that is five times larger than any other social network. 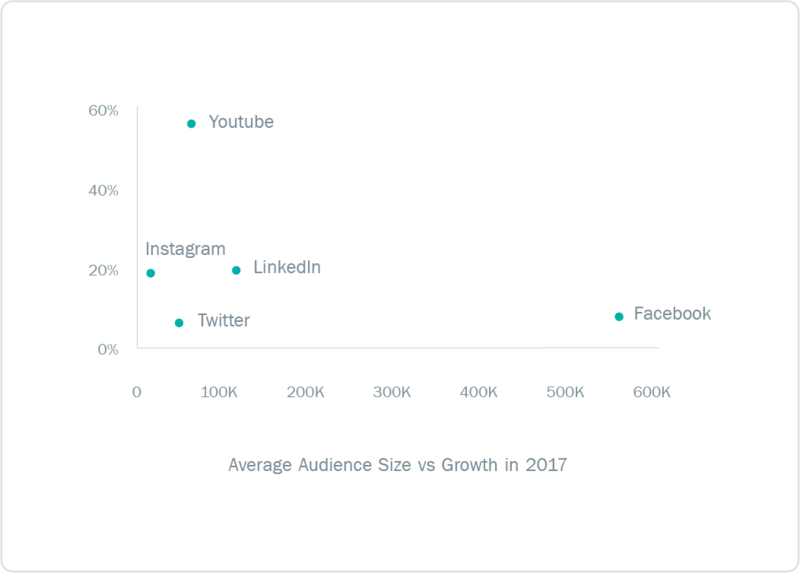 The second largest is on LinkedIn, where companies grew their audience by 20% in 2017. The average audience size, measured by the number of subscribers to a Channel, on YouTube grew by over 55%. Audiences for insurance companies grew the slowest on Twitter. Audiences on Instagram grew at almost 20%, but the average audience size for insurance companies lags far behind what they have on other social networks. Do Mascots Help Insurance Companies? The three insurance mascots need no introduction. Flo, Gecko and Mayhem are ubiquitous in the insurance industry. However, are the other 19 insurance companies analyzed in this report missing out by not having a mascot? The social data has some revealing numbers. 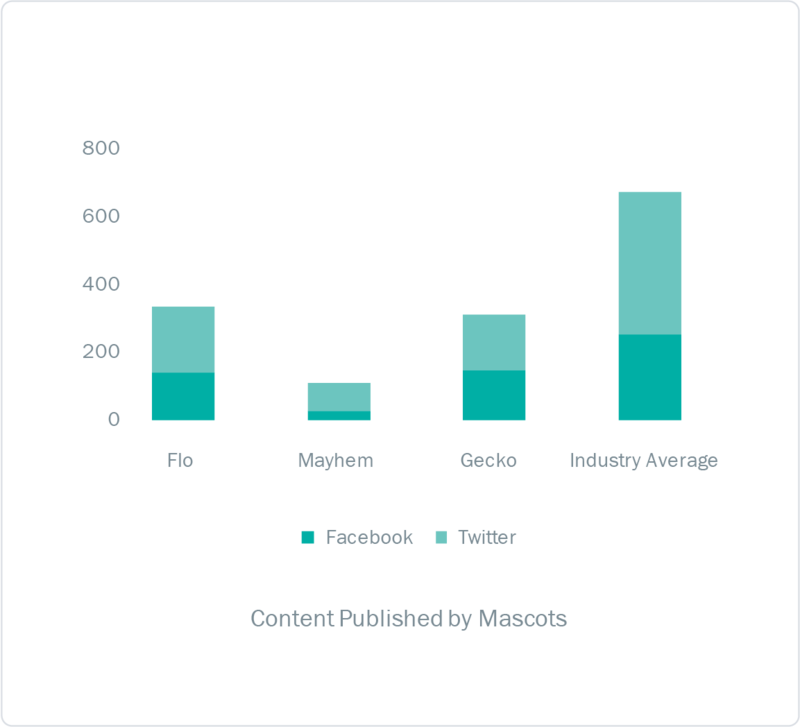 Both Flo and Mayhem have audience sizes that are many times larger than the average insurance company on Facebook and Twitter. However, Flo lost 4% of her fans on Facebook in 2017 and the numbers keep on falling. Mayhem also lost fans in 2017, but not on the same scale as Flo. Gecko grew its fanbase by 1.68% in 2017, which compared to the average growth rate of 8% for other insurance companies on Facebook, isn’t that great. 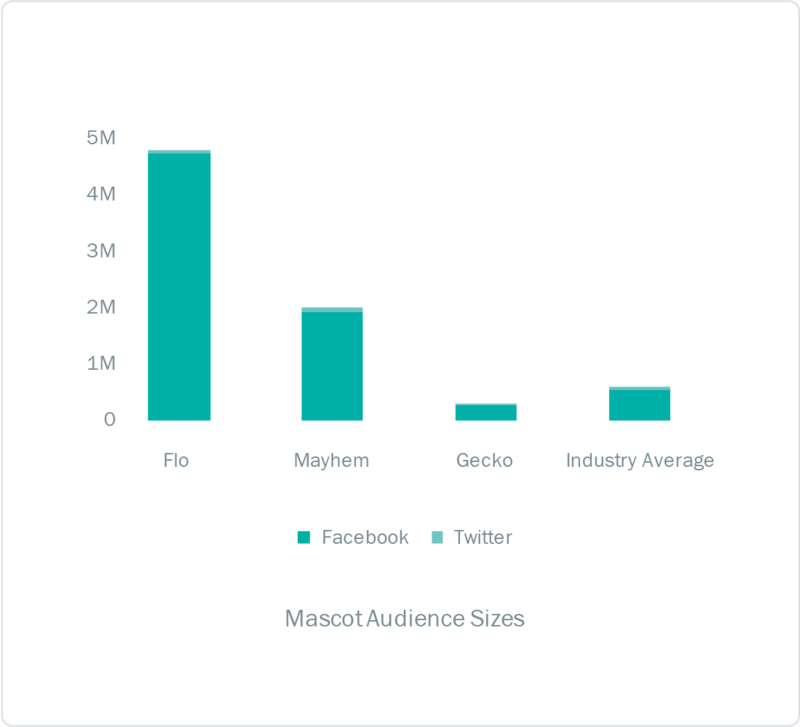 Managing the social presence of a mascot requires creating more content tailored for the mascot. It’s not too surprising to see that the social profiles of all three mascots published less than half the industry average on Facebook and Twitter. When we consider the number of interactions (Likes, Comments, Shares, Retweets) per post, the outlook is even gloomier for Flo and Gecko. 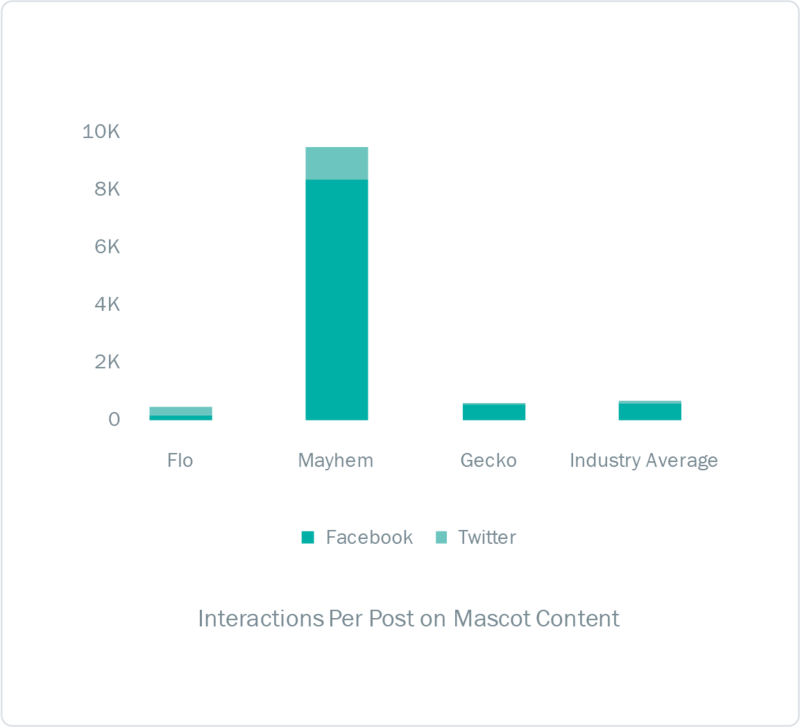 Neither mascot could beat the industry average for interactions per post. However, Mayhem is in a league of his own. His social profile published three times less content, but managed to translate that into 17 times more interactions per post than the other mascots, and 13 times more interactions than the industry standard. So what is it that makes Mayhem so successful? For starters, his Facebook page is promoting 50% of its content. This paid push gives content an 82% boost in engagement. By contrast, Flo and Gecko promoted 0.5% and 27% of their content respectively. The content from Gecko takes the form of asking about life’s little mysteries and wry takes on everyday scenarios. Again, without paid promotion behind them, these posts largely fall flat and most often have no connection back to the brand. Mayhem seems to be the personification of Murphy’s Law. Anything that can go wrong, will go wrong, often in the worst possible way. This universal truth has resonated well with his audience, but the two stand-out pieces of content from 2017 involved neither mayhem nor universal truths. The first was a call to submit a poem to Mayhem for the chance to get a personal Valentine’s video recorded by Dean Winters who plays the Mayhem character. Over 1,500 people replied to the post with hundreds taking the time to submit their own poems. 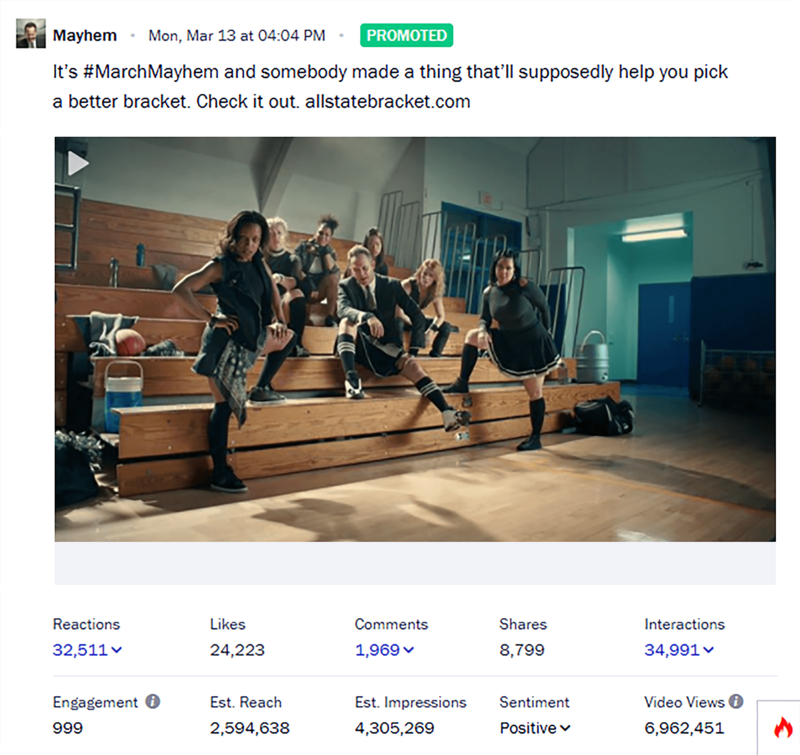 The most engaging post had Mayhem in a skirt, talking about March Madness, for which Allstate is the sponsor. The video — since removed — generated nearly 9,000 shares, and the word cloud of user comments below shows that people loved it. The following word cloud was used to understand the key terms and phrases that 22 insurance companies included in this report spoke about on Facebook in 2017. The larger the word, the more frequently it was used. The darker the colour, the more engaging it was. Tips is the most talked about topic for insurance companies. Over 500 posts in 2017 mentioned the word tips, and it engaged quite well with fans. This post from Mercury Insurance about safety tips during Halloween saw the highest amount of engagement around this word. Since 2014, insurance companies have been scaling back the amount of content that they publish across all social networks. Content being published to Facebook has reached its lowest level since 2012. Companies now opt to post five times a week rather than every day. 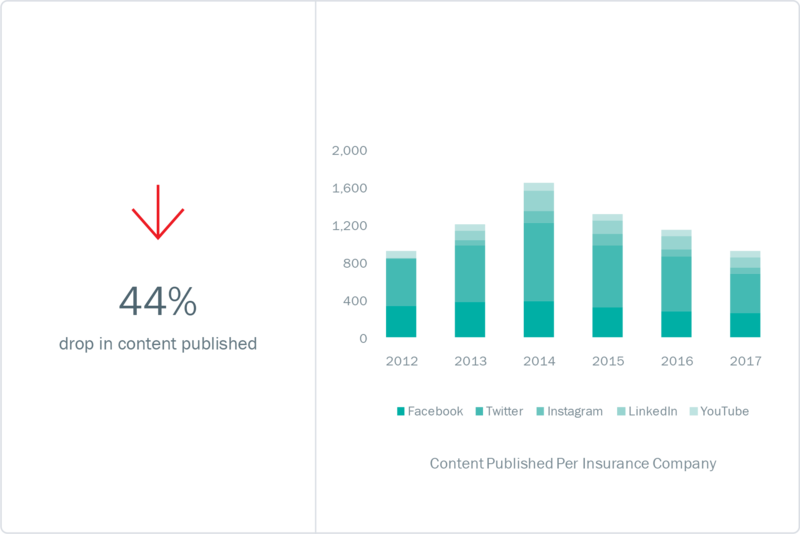 Although Twitter remains the favorite social network of insurance companies to publish content, the amount of content being published since 2014 has dropped by over 50%. Some of this drop across social networks could be due to more effort going into ads and ‘dark posts’, which don’t appear on the public timelines for social profiles. However, this drop in published content is a trend we have seen across industries. Travelers Insurance published 598 pieces of content on Facebook in 2017, more than double what the average insurance company published. AmFam as the company published twice as much content than average in 2017. In 2017, Facebook accounted for 70% of all user interactions. However, average user interactions (Likes, Comments, Shares, Retweets etc.) across social networks are at their lowest point since 2014. The drop has been most pronounced on Facebook, where content published in 2017 generated 34% less interactions per post than in 2014. In other industries, this drop in engagement on Facebook has been offset by exceptional gains on Instagram. Insurance companies, however, have not received this engagement dividend. Companies are generating about the same amount of user engagement in 2017 as they were in 2014. 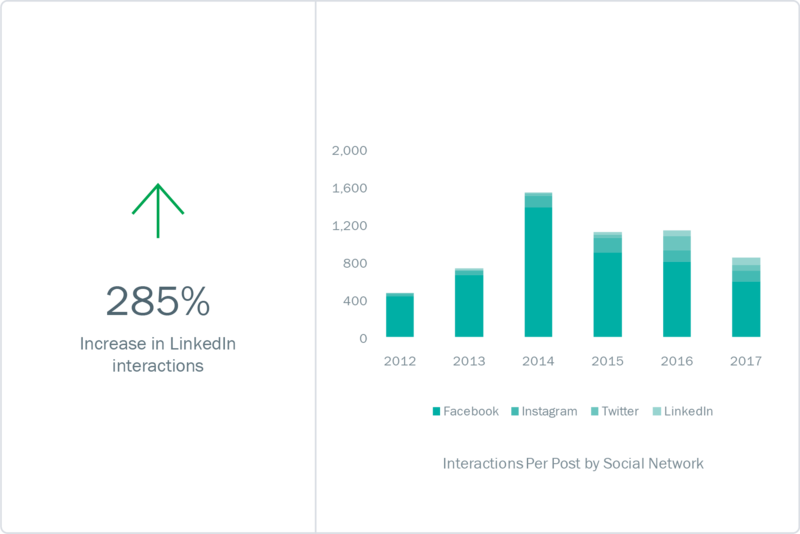 LinkedIn is the only social network where interactions per post has grown, but it is still just 10% of the engagement received on Facebook. Esurance saw four times higher engagement on Facebook than average thanks to its content which focused on life hacks around the home and not on insurance. Liberty Mutual published three times more content on its LinkedIn page than the industry average and garnered 37% higher interactions as a result. The insurance industry bucks the trend we have seen in other industries when it comes to the type of content being published. Interestingly, Links are now the preferred content type for insurance companies on Facebook. The use of Links has remained steady for the last four years. 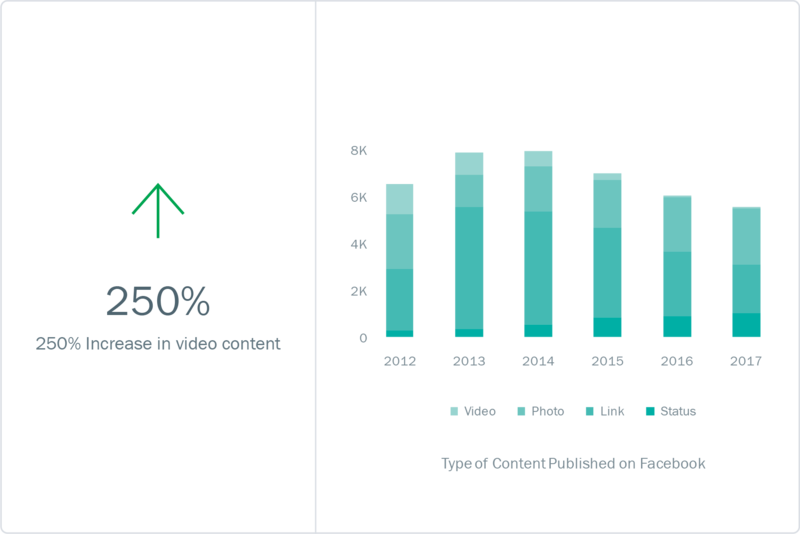 The use of Photos has shrunk by more than half, while there has been a year-on-year increase in the number of Videos being published. This is somewhat unusual given that Links account for about two-thirds of the total interactions compared to Videos and less than half the interactions on Photos. Erie Insurance was one of the most prolific users of Links in its content mix. 90% of content it published in 2017 were Links. 50% of Farmers Insurance content was Videos in 2017, but out of all the content types, it accounted for the lowest interactions per post. Photo content engaged three times better. It’s no surprise to anyone working in social media that Facebook’s organic reach is not what it used to be. The free lunch for brands is over and businesses must think of Facebook (and other social networks) as paid channels. With the reduction in organic reach, we expected to see an increase in the amount of content being boosted by brands. However, our analysis shows that the percentage of content being promoted peaked in Q4 of 2016. Quarter-on-quarter, the amount of content being promoted has remained relatively steady at 22%. Given that boosted content earns more than twenty times the engagement on average, it might pay for insurance companies to boost even more content on Facebook. Photo posts that have been boosted see, on average, as much as thirty times more engagement. Esurance promoted the vast majority (79%) of its Facebook content in 2017, which helped it generate five times more interactions than the industry average. 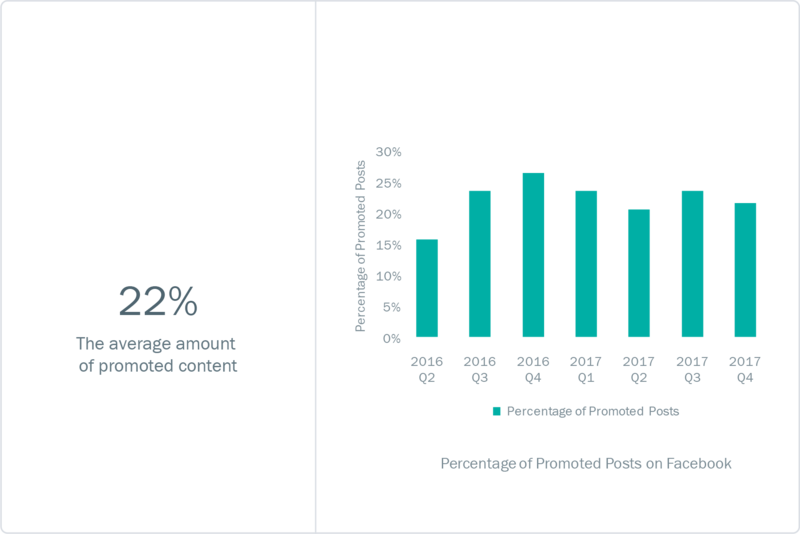 Nationwide Insurance only promoted 7% of its 374 posts in 2017, but each boosted post saw 7,500% higher engagement than its non-promoted content. A number of studies have been done over the years about how people perceive customer support via Twitter. In each of the studies, they asked how quickly the customer wanted a response from a business to their tweet. The percentage varies between 42% and 84%, but it shows that if people are tweeting to your brand, they do expect a response and quickly. In 2017, insurance companies were taking an average of 16.5 hours to respond to customer tweets. 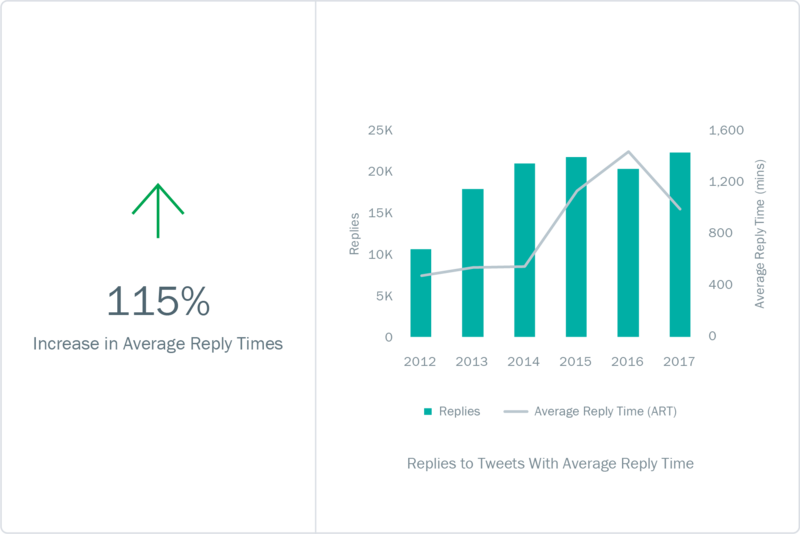 56% of tweets were replied to within one hour — up from 45% in 2016. 87% of GEICO’s primary Twitter handle’s 7,042 replies were sent within 15 minutes of the customer sending the tweet. MetLife replied to nearly 5,000 tweets in 2017, but more than 72% of replies took longer than 24 hours. The amount of videos being uploaded to YouTube has changed little in the years since 2012. In 2017, insurance companies uploaded an average of 66 videos each. 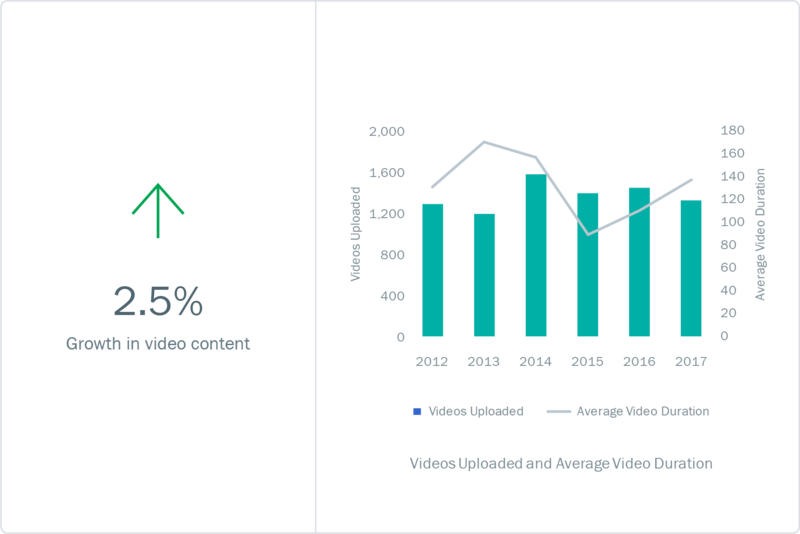 The average duration of these videos has fluctuated, but in 2017 videos were approximately the same length as they were in 2012. We found that videos by insurance companies attracted a lot of negative interactions in the form of “thumbs down” votes. For every 2.19 “thumbs up” votes, there was 1 “thumbs down” vote. Allstate Insurance uploaded 325 videos to YouTube in 2017, nearly five times more than the industry average. State Farm added over 83 million channel views in 2017, thanks to its five 16 second “Chalkboard” ads that received tens of millions of views in August.